I.e. I don't get to choose packages/components like when using the builder wizard. So indeed, there seems to be a component that the builder wizard installs, but imagex does not. Like you say, embedded is a different beast than other win7 installations. Seems there is no obvious path to go on right now so I'll put this on hold for a while. Can someone please help me? I use the program to install windows 7 to my usb external hard drive and i see the windows files are there but im not able to boot with it. Edited by Firebeast, 25 September 2015 - 06:10 PM. Hello, I am trying to do a fresh install of Windows 7 onto a new 500Gb SSD to replace an existing 120 which is at full capacity. Rather than using the Data Migration program supplied with the drive which will move everything including problems I have with an HP printer program which won't reinstall. My plan is to re-install (from OEM CD?DVD's) all my programs onto the new SSD as a USB drive before physically replacing the existing drive in the desktop. Will this work using the Fast Installer program and will the drive letters sort themselves out or am I better just to swap out the SSD and start from scratch? I don't confess to being an expert but can find my way around most things with some guidance. or am I better just to swap out the SSD and start from scratch? I would swap the SSD first. If anyting goes wrong, the first SSD is available still. Kind of a back up. This is a bit of a bump, but I'd like to install Windows 7 Professional on my external HDD, so I can boot from Win7 when need be, instead of being stuck with Win10. 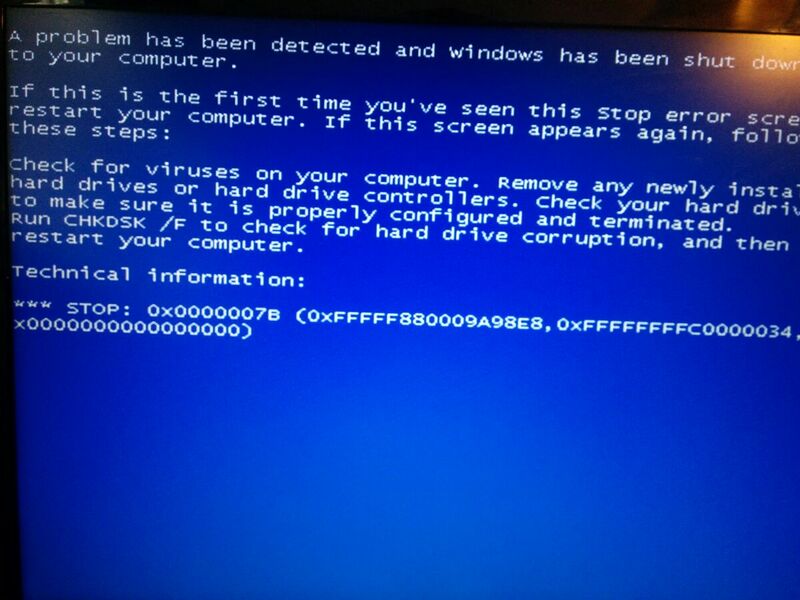 I followed the instructions here, but when I boot to my HDD, it starts showing the windows loading screen, but before finishing, it gets this bluescreen. I have my HDD split into 2 partitions. One has all my data I need to keep saved. The other is for windows 7. I have the other one as my active partition on the HDD. When I run the program, I select the partition for windows 7 as the one to install to, and the one to create the boot partition on. Then when I restart, I boot to the HDD. I have tried creating a separate partition on the external HDD just for the boot loader, but it hasn't helped. Someone said that this wouldn't work when installing SP1, so I've tried installing a version without SP1. I use 7zip to extract the iso and get all the necessary files. Also, I have multiple versions of bdcdboot, BootSect, and imagex. I initially used them all from my "...\Program Files\Windows AIK\Tools\amd64". Using the one's from the "...\Tools\ia64" folder causes the application found here to not even work. I don't use the one's from the "...\Tools\x86" folder, as I'm using 64bit. I changed to using the bootsect.exe from the "boot" folder of the windows iso I'm using. Someone suggested putting this program and the windows files on the other partition of the HDD I'm installing to, which didn't help. Any ideas? Do you use a USB3.0 port? Windows 7 dosnt provide USb 3.0 drivers by default. Try the native stack approach too. Read this thread. hello.., is there a way with this tool of upgrading, reinstalling (not clean install) an already cloned win7 OS on a usb hdd partition? I mean can there be a modified script version without formatting, just reboot and do a non destructive reinstall or upgrade to a later version maube? --- in order to fork the os to a portable form or reinstall to solve bsod issues. If not, do you think of other ways that this usb partition OS clone (*with an already working modified boot entry), can be reinstalled or upgraded? or there has to be one and only way of the usb to sata disk switching? Edited by istinnstudio, 14 February 2018 - 07:20 PM. Tried but failed. I have 3TB Seagate HDD I have a 15 GB partition, I kept this partition for "Window 7 On The Go" I was searching for a tutorial how to install Windows 7 in that partition, I found this tutorial, I have loads of data in my 3TB HDD and I was not sure about this method, I was afraid of my 3TB HDD getting formatted accidently I didn't try, recently I got a new laptop of 2TB HDD transfered all my data to laptop and then tried, thankfully my HDD didn't get formatted but after running Install.cmd, I had to boot my PC into my 3TB HDD, but unfortunately it didn't boot into 3TB HDD so I couldn't complete the installation, tried 3-4 time but my PC is not booting into my HDD. I did change the boot device from boot menu but not booting into 3TB HDD. Please help me, I desparately need a Windows 7 On The Go. Just for your information, my 3TB HDD need external power source to work, does my problem lie here only and can't we do something about this? "Doesn't boot" is not a description of what happens, nor "I tried" describes anything. But it isn't uncommon that such a large hard disk is not bootable, it depends on a number of factors, including the specific firmware BIOS/UEFI, the way the disk has been partitioned (MBR vs. GPT), etc. This manual tutorial was however intended for a "normal" 7 on BIOS/MBR. BUT you SHOULDN'T even THINK of experimenting with a hard disk that contains valuable data. 1. Don't worry about my data, I have already mentioned, I have already backed up my data in my new Laptop. 3. My system is very old and it is BIOS, I didn't change the first boot device in BIOS just selected my 3TB HDD from boot menu. Thanks for the new tutorial, but as far as I understand this one is for VHD, I want to install directly in my 15 GB partition and don't want to use third party app. Can my problem be fixed or I can't boot into my 3TB HDD? If you can suggest something I can try. I tried means I tried to boot 3-4 times by selecting my HDD from boot menu but nothing happens, no error nothing, it just boot into internal HDD after 5-10 secs. Edited by nice_guy75, 07 June 2018 - 02:18 PM. Problem is that you cannot really-really MBR partition a 3 TB hard disk unless it exposes a 4 kb geometry, and if it does, it won't be bootable, or - otherwise - you can use only the first 2 TB MBR partitioned. If the disk is 512 bytes/sector and you partitioned that 3 TB disk under Windows 7, it very likely is GPT, if you partitioned it under Vista or earlier it is definitely MBR (but you cannot access more than 2 TB), Windows 7 AFAIK can see the whole disk and automatically creates a GPT disk. If the BIOS is very old, it may have much smaller limit for booting (from USB bus or generally) such as the 128 GB/137 GiB barrier (rather common on the USB stack on older BIOSes). So, post the exact make/model of the disk you are using and if you can also the BIOS/motherboard you are using, it is possible that the issue is related to disk size (and may be solved), that is related to disk sector size (and may not be resolved) or that is connected to BIOS and could be soved by using an intermediate bootmanager such as grub4dos with an "own" USB stack. Ideally you could try with a smaller disk. The part that is failing right now is the early booting part, so all is needed is to have the "right" MBR code and PBRcode (in case use bootsect.exe to write them) and a copy of BOOTMGR in root of the active partition for the test, it shoull boot and then halt with an error that it cannot find the BCD. My HDD is seagate SRD00F2, my friend got it for me from US some 5-6 years back. Yeah I partitioned it on Windows 7 and there are as many as 7 partitions in this disk. I don't know much about MBR and GPT partition so only I had to search the net earlier as well and I guess I made a mistake in understanding. If it is GTP can I still have a working Windows On The Go? Now regarding BIOS, I am trying it on office PC and currently I am at home, will give you BIOS and motherboard information tomorrow. I am a newbie so please help me considering it. I think you can help me to have a Windows 7 On The Go. Please bear the pain you might experience in helping me. Your BIOS doesn't (cannot) see the MBR code (simply because such code doesn't exist in the GPT scheme) and thus it doesn't (cannot) boot. There are workarounds, not exactly aimed at the total beginner (nor suitable to the faint of heart) but all in all doable , that imply the use of an intermediate bootmanager. and, as often happens for "work in progress" threads everyone has chimed in with this (or that , or that other) different ideas/projects/whatever, so I wouldn' t really recommend it if not to an extremely advanced user with a lot of patience. Point is whether it would be actually worth it to use this (or that) experimental (and unsupported) methods to "only" have that Windows 7 installed to that disk. Do you have other computers running older than 7 Windows OS? Ok I have checked, My disk has MBR partition, I have formatted it on XP with 512 bytes/sector, and then installed Windows 7 Ultimate still it is not booting into HDD. So I believe all these tutorial and advance things are not required in my case, as my disk has MBR partition and I am trying to boot into it using a BIOS. I was trying to have a Windows 7 On The Go (W7OTG) for my office computer, which is stil on XP. My machine is Acer Veriton M275, I have already downloaded the latest firmware of its BIOS but I did not update my BIOS before, I have seen the tutorial for updating BIOS and I think I can update it. Though my BIOS version is P01.A4 release date is 6/12/2010. The latest version of BIOS is P01.C2L released on 5/03/2012. Now the last thing left is USB eclosure of my Seagate SRD00F2, if it is, what you are assuming, an auto-switching type, then I won't be able to boot into this HDD, right? Means this is a dead end for me? In this case do you recommend me to update my BIOS, only for this purpose or I should stop trying and should settle with Windows 7 on USB? Edited by nice_guy75, 08 June 2018 - 06:40 AM. If I need a "helper" to over come this limitation, can you please help me in getting one and method to use it so that I can boot into my Seagate 3TB HDD? Edited by nice_guy75, 08 June 2018 - 07:26 AM. It is largely unexplored land. How (exactly) did you partition it? If you did that to the disk when outside of the USB case, then it is possible that it was exposed as 512 bytes sector BUT, if this is the case, then you cannot have all the 3 TB accessible. If you did that when the disk was inside the USB case AND you can access all the 3 TB THEN the disk is seen as 4kb sector. It needs too be checked if the disk exposes (when in operation inside the USB case) 512 bytes or 4 kb. use it to save a copy of the MBR (physical drive) and of bootsector (logical drive). Compress the two files in a .zip or .7z archive and attach the archive to your next post. Again, this is mathematical, a 512 bytes/sector disk maxes at roughly 2 TB, on the other hand no BIOS will boot from a 4 kb disk, or at least this has been the experience till now.. It has to be seen (I believe it is possible, but needs to be tested) if a recent version of grub4dos (booted from the internal disk) can access and mount the 4 Kb based filesystem and the Windows 7 files can then proceed to boot the OS. Updating the BIOS (which in itself is a *somehow risky* operation) is NOT recommended, unless you are experiencing any issue, surely (like 99.99%) the BIOS update won't solve the issue at hand (it may resolve other issues, but if you have none, leave the BIOS as is). I hate to say this, but it is IMHO not worth the time/effort of the experiment, this kind of stuff is fun and interesting when it comes to doing the experiments for the sake of the experimenting and learning new, strange things, but not when the scope is solving a real world problem. Get a smaller USB disk, let's say 512 GB or less, it would be easier and safer. I don't remember but I guess I must have partitioned it on Windows 7. But today I have connected my 3TB HDD to my office PC running on XP, right clicked on the drive I wish to install Windows 7, selected format option and changed Allocation unit size to 512 bytes and clicked on OK, doesn't it format the drive 512 bytes/sect? If it can be done using Grub4dos, I would love to learn it. I really like learning new things especially related to computers. So I request you to please invest some time to help me learn this. Last but not the least, I got your point and not going to update my BIOS, but looking forward to learn to boot into my 3TB HDD using Grub4dos, I want to learn it, though I can have Windows 7 On The Go on any of my Pen Drives but I want to learn this thing. I hope you understand. Though I really appreciate your passions, wasting your time on a newbie like me. Thank you very much. Tried this tutorial but no success. Yep, checked the files you posted. The disk is MBR (good) BUT it exposes 4kb sectors (bad). You don't really want to "install" grub4dos. (it is the latest 0.4.6a version from last year, it should be good enough for testing, latest-latest versions resulted in some bugs, so for the moment it is better to avoiid them). and from it extract ONLY grldr, copying it to root of the C:\ drive (i.e. C:\grldr). When you edit the BOOT.INI check that you have a "decent" timeout, like 10 seconds or so, to allow you to make a choice. Next time you boot, you should be able to choose between "normal" XP booting and "grub4dos". If you choose grub4dos you should find yourself to a grub> prompt. and you should be back to the BOOT.INI choices. Today is Saturday and weekend has already started, so I would go to the office on Monday, I don't have XP machine at home. I am currently on my laptop with Windows 10, so I can't follow your tutorial just yet. Before I go ahead and edit Boot.ini, I want to know where should I add this line in my boot.ini? secondly, I am little confused. Once I see grub&gt;prompt how to boot into Windows 7 of 3TB HDD from grub&gt;prompt? If I give chainloader /NTLDR and boot command, I would see boot.ini options of "normal" XP booting and "grub4dos" option and by selecting "normal" option I can boot into system partition of my internal HDD which has XP, and If I select "grub4dos" do I have to give chainloader /grldr and boot command to load into Windows 7 of my 3TB HDD? Will it seach grldr itself or I have to give the path as well like chainloader /K:/grldr, where K happen to be my drive where I have installed Windows 7 or mere "chainloader /grldr" command is sufficient enough to boot into Windows 7 of 3TB HDD? If you choose grub4dos you should find yourself to a grub&gt; prompt. Edited by nice_guy75, 09 June 2018 - 03:16 AM. Once the thingy is verified to be working, loosely you will need to initialize the grub4dos internal USB stack, see if you can access the USB disk, and then attempt to root to the partition where windows 7 is and attempt to chainload its BOOTMGR, possibly there will be the need to re-map the disks and/or use an image to start the booting of the Windows 7, it has to be seen. Once (IF) a set of commands is found to be working, they can be written to a menu.lst (the equivalent of the boot.ini menu for grub4dos) so that you will have an entry to select for booting the Windows 7 without needing to type the commands every time. Please reinstall a copy of the above file." I checked......... the file is already there in system32 folder of my XP as well as in Windows 7. Tried reinstalling windows 7 once again but same problem. It is not taking me to the grub>prompt so there is no question of executing other commands which you gave me. Edited by nice_guy75, 11 June 2018 - 05:46 AM. You were right it is not that easy to do, "Setup grub4dos" means editing boot.ini of my XP and placing grldr in the root of the partition where I installed Windows 7? No, you need to put the grldr in the internal disk, in root, (where BOOT.INI is, that normally is your C:\ drive). The point is that without *something else* (which hopefully is grub4dos/grldr) your BIOS canNOT access the 3 TB disk (more technically it an access it, but since it is 4 KB sector it cannot understand the booting code in its MBR). You have to think that grub4dos in this case represents (loosely) an extension of your BIOS. Went ahead a little, trid all these command, and finally I got the location of bootmgr, it is in (hd0,0) (not sure if it is the right location or not) but when I gave boot command, it is saying "kernel but be loaded before booting" now the question how can I can load the kernel. I hope you won't leave me in the middle. Yep, you are always going a couple steps ahead, nothing bad of course, and as a matter of fact within limits it is a good thing, you are curious and you want to explore things, but in this case I believe you'd better take baby steps. Allow me to doubt that the bootmgr (the one on the USB hard disk) is on (hd0,0). Now shutdown, connect the USB hard disk and boot again. 5) any difference (like an added hd1) on the list of devices? 7) what do you see? Please report. 11) grub4dos should give some feedback, report it, something like "will boot xxxx from drive=xxxx, partiyion xxxx (hidden sectors xxxxx)"